Be it a reaction to junk food or to soaring vegetable prices, weekend time pass or a simple way to stay fit, maintaining a kitchen garden has become an increasingly popular practice. Whether we have a balcony, a roof or a small courtyard, we can all aspire to our tiny patch of greenery and enjoy healthy and tasty vegetables. Those who are spoiled for choice should opt for the balcony or the courtyard window ledge, rather than any place opening directly onto the street to avoid exposure to polluting particles. If your only available space faces a very busy road, then plant a sufficiently tall hedge to protect your kitchen garden. Another key factor: sunshine exposure and duration. Some species such as tomatoes need 6 to 8 hours of sun per day, whereas lettuce and spinach only require 4 hours. And mint prefers shady places. Potting soil (organic if possible, or vegetable compost rich in nutrients) and containers (planter, trays, pots, etc.) are essential. The choice of containers depends on what you’re growing (some species, like aubergines and cucumbers, require a larger volume of depth and surface area), the area of the balcony as well as the co-ownership rules of your building. I suggest you start by checking if the structure is strong enough to support the load of a garden. In addition to seedlings and seeds, you’ll also require some gardening tools such as a spade, a small fork, a watering-can, or a trowel. Saucers to catch the water under the pots are also a must. This choice is determined by the space available, the direction of the site, and, of course, the tastes of the amateur gardener. Herbs are well suited to cultivation in pots and grow really fast. Tomatoes, peppers, radishes, lettuce, cucumbers and zucchini can grow in a medium sized tray. If there’s enough space, you could even grow strawberries and raspberries. Important tip: some vegetables grow best when combined with herbs that protect them from parasites and insects. So, tomatoes pair well with basil or dill, carrots and radishes with chervil, and aubergine with thyme or parsley. The sowing calendar is the same as that of a full-fledged kitchen garden. 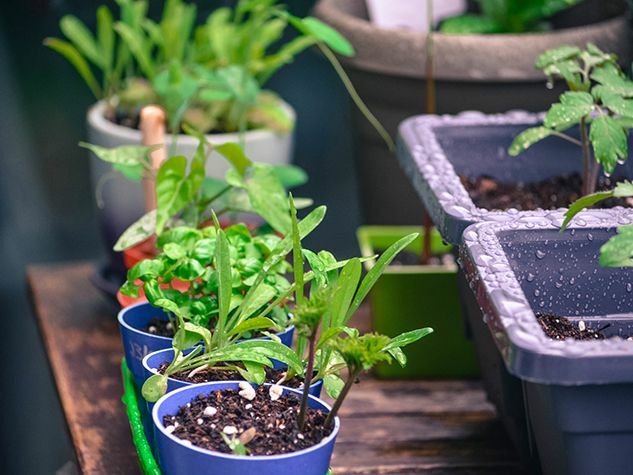 For cultivation in pots, you can gain a few weeks by leaving them out during the initial days of full sunlight in the spring, provided you shift them back inside at night to prevent freezing. For more specific advice, there are tons of websites where you can find information, instructional videos, lists of local conferences, etc. I find the Kitchen Gardeners International website particularly helpful. Like any garden, the success of your little balcony garden requires proper maintenance. Watering is essential. In very hot weather, it is better to water early in the morning or late at night to avoid early evaporation. Watering should take place at midday in spring and autumn. We must also rid the plants of dead stems and leaves and fight against pests and diseases. Of course, we only use environmentally friendly methods (stones and mulch on the surface, combinations of vegetable crops, etc). I hope you have good fun and a bumper harvest! You make it sound so straight forward and the thought of an urban garden is wonderful, but I tried it last year and am constantly paged by cat poo and slugs – any suggestions? « Why should we build our own urban garden?